Have your own DJ? Just need DJ Equipment Hire? If you have your own DJ and are just looking for equipment hire, Elation AV can help there too, we have an extensive catalogue of equipment to hire from all the major brands like Pioneer, Denon, American DJ, Laserworld, Martin, and many more. If you are unsure what your DJ requires then ask him/her to get in touch with us and we will be able to arrange everything. Elation AV pride ourselves in being the premier Sound and Light AV Hire company in Leeds. Our delivery and collection service is second to none and we will go that extra mile to make sure our customers get exactly what they are wanting. 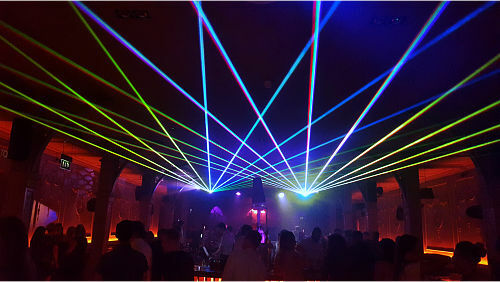 Our DJ Services include being able to offer spectacular LED Uplighting and numerous special effects. Our Uplighting can be used for many purposes including Weddings, Product Launches, Architectural use, Venue Uplighting and more. Our special effects section is where the real wow factor comes into it’s own, we can offer the following to amaze your clients or guests. Elation AV's Laser Lighting speaks for itself and as such needed its own mention. We have multiple laser types which help us to build any show to your requirements. A show can be anything from as simple as displaying scrolling laser text at a wedding to a huge corporate outdoor event with water canons as shown below. We have lasers from 2 Watts up to a staggering 14 Watts RGB Piko Unit. Elation AV can also offer laser hire throughout Yorkshire, our most common lasers we hire out are around the 2.5 Watts power range.